Policy debate in the current recession is often portrayed to be an irreconcilable political battle, pitting those pushing austerity against those advocating growth. Indeed, substantive real differences do separate groups having different views on what different policies can achieve. But, equally, uncertainty on the state of the economy clouds judgment on what appropriate policies should be, especially so in times of economic crisis. This article examines that uncertainty. By studying one example — UK policy options at the beginning of 2010 — it argues we need to understand better the implications of different measurements on an economy. No one wants to live in a stagnant economy. Even those who don’t believe higher incomes make people happier can’t bear to see their honest, hardworking neighbours unable to make monthly rent or mortgage payment, or having to choose uncomfortably between new clothes and shoes for the kids or food for the table. No one wants to see masses of unemployed on the streets. Everyone is for growth. But, at the same time, even the most diehard pro-growth proponents must acknowledge that government efforts to further increase growth cannot always be appropriate. If an economy were already close to full employment or were in any other way overheated, then it is right for fiscal and monetary stimulus to withdraw. Raising tax revenues and lowering government spending — putting the government’s finances to order and restoring to health the nation’s balance sheets — all have a place in sensible, responsible policy-making. Standing for growth does not mean constant and unwavering support for always high government spending and expansionary monetary policy. By the same token, backing policies to lower debt and deficits does not mean wanting economic life to be wretched. Even when the final goal is the same — to have a healthy, prosperous, inclusive economy — depending on circumstances there is a time and place for different approaches to government policy. A debate on UK growth versus austerity is on one level a debate about what policy transmission mechanisms are most effective for bringing about long-run sustainable economic growth: People disagree about what works. But equally important the debate is one about the current state of the economy. Only after the fact will it become obvious what the right policy actions should have been. Moreover, because of lags in their effectiveness, policy actions need to anticipate: Will expansionary effects kick in only after the bottom of the economic cycle has already passed, and thus overheat an already healthy economy? Many observers have firm views, conditioned by sound economic analysis, on the first of these issues, what appropriate growth and austerity policies are. It strikes me, however, that the second matters much more in extraordinary situations: in those circumstances, knowledge of the current state of the economy necessarily carries far greater uncertainty. Generally, the range of economic statistics to look at is broad and constantly changing. External circumstances in a shifting world economy will confound historical regularities. Economics education in every institution makes students understand mechanisms of how policies affect an economy, but hardly anywhere is there training on how to assess rigorously the state of an economy. That latter is merely “monitoring”. Perhaps accurately judging the state of the economy is impossible — but that doesn’t mean zero understanding is where one should stay. That this is important is usefully emphasised by looking over a recent turn of events. In February 2010 twenty economists signed a letter to London’s Sunday Times supporting a plan to lower steadily the UK structural budget deficit, starting as early as the 2010/11 fiscal year. (For transparency, I should say here I was one of those 20.) The letter suggested that failure to do so could, among other things, raise interest rates and undermine UK recovery, given how the economy had entered the recession with a large structural budget deficit. Not unexpectedly, this proposal was not uniformly accepted, and many distinguished economists suggested instead that such a policy was potentially risky and that the first priority had to be to restore robust growth. But to bring about growth was never a point of dispute. So, it might be useful now to look back and assess the balance of risks then extant. Did circumstances really remain fixed, and were they really so transparent? Complicating the picture: Statistics on recessions become available only with a fixed delay — to be in recession, an economy has to have had negative GDP growth over two successive quarters. So, to be in a double dip recession, well, it’s not enough just to announce one’s beliefs, the data have to come out just so. What did the world look like in early 2010? In September 2008, Lehman Brothers had filed for bankruptcy. In January 2009 the IMF had predicted world growth would fall to 0.5% for the year ahead, only three months later to revise the figure significantly downwards to -1.3%. The World Bank had forecast in March that the world economy would contract by an even larger 1.7% in 2009: This would be the first decline in world GDP since the Second World War. The International Labour Organization estimated that 51mn jobs would be destroyed in 2009, raising world unemployment to 7.1%. Growth in China had fallen from 9% in 2008 to an annual rate of 6.1% in the first quarter of 2009, the lowest recorded figure since 1992. Between July 2007 and November 2008 world stock markets had lost US$26.4 trillion in value, more than half of world annual GDP. In April 2009, Olivier Blanchard, the IMF’s Chief Economist, had written “the crisis appears to be entering yet a new phase, in which a drop in confidence is leading to a drop in demand, and a major recession.” The UK had been officially in recession mid-2008, with the last two quarters of 2008 suffering declines in GDP. By the beginning of 2010, the UK recession was already 18 months in train. In this modern era, advanced economies (like the US) have only had short sharp downturns: the 11 US recessions since 1945 averaged only 11 months in duration, with the four recessions between 1980 and 2001 lasting 6, 16, and then 8 months twice, respectively. By 2007, the UK had gone 15 years since the end of its last recession, one that lasted just 15 months. Of course, with hindsight, we now know it is well possible for slumps anywhere in the world to drag on, but set against both the UK’s own experience and against a broader history (that of advanced economies, like the US, towards which the UK had progressively become more similar), it was not unreasonable to think by early 2010 that the UK was about ready to grow again. No one would have reckoned in early 2010 that the global economy had regained robust health. But, equally, was it apparent the international situation was dismal? By the first quarter of 2009, Brazil was reported to be no longer in recession, having grown 2% after the two previous quarters of GDP declines. The OECD forecast the Eurozone and the US would show positive growth in the last six months of 2009. Back on track: By mid 2009 Asia’s industrial producation had recovered not just to pre-crisis levels but to its pre-2008 growth trend. 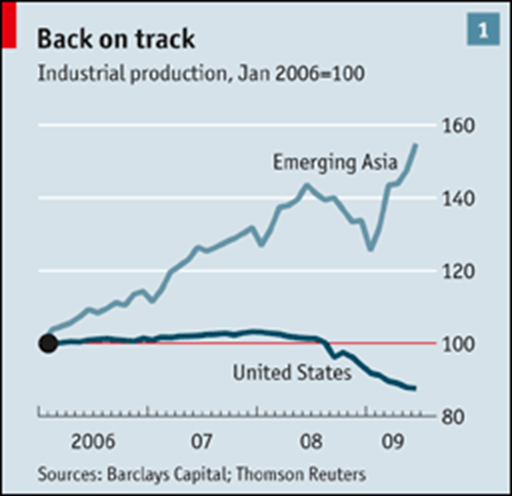 Early 2010 was six months past when incomes in China and the rest of emerging Asia had already recovered. Industrial production was not just back to pre-2008 heights, but to its extrapolated pre-2008 growth trend. The second quarter of 2009 saw a string of astounding figures from across Asia: all at annual rates, the South Korean economy grew by 2.3%, its fastest expansion in over five years; the Chinese economy grew 7.9%; the Malaysian economy expanded by 4.8%; the Thai economy grew 2.3%; both Japan and Hong Kong were showing rising incomes again, after four successive quarters of GDP declines. Singapore announced its emergence from recession, big-time, with annualized GDP growth of 20% that quarter. 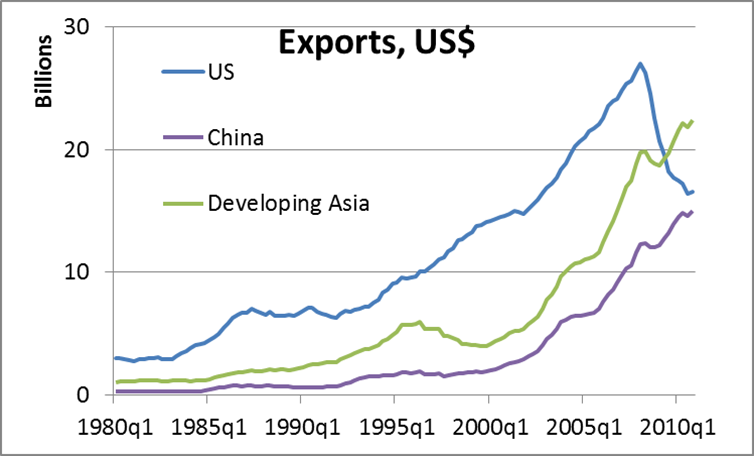 Sure, China’s government had announced in November 2008 a US$600bn (CNY4,000bn) fiscal stimulus package: that by itself was impressive enough, but also most observers at the time believed growth in export-oriented China and Asia occurred primarily from Western demand. The East was growing again. Surely the West must be demanding. It was natural to think that, somewhere somehow, the West must have recovered. That “somewhere, somehow” was not unreasonable to hypothesize in the slew of policy actions undertaken in all the world’s major economies between late 2007 and early 2010. In September 2008 the US Federal Reserve, the Bank of England, the European Central Bank, the Bank of Japan, the Bank of Canada, and the Swiss National Bank, in concert, added US$180bn of liquidity to international money money markets. By November 2008, in the space of just four months, the US Federal Reserve had pumped US$592bn into the US$ monetary base, increasing that monetary base by 70%. In October 2008, US lawmakers approved a US$700bn rescue package to purchase bad debt from US banks; the UK government unveiled a reform package. amounting to £400bn (i.e., again US$700bn) to provide funds to UK financial institutions; the Japanese government announced a US$270bn fiscal stimulus package targeted at families and small businesses. The following month saw China’s fiscal stimulus of US$600bn (already-mentioned) and the European Commission’s US$260bn recovery plan. Further add into the mix Japan’s April 2009 stimulus package of US$98.5bn or 2% of that country’s GDP, and we’re talking significant fiscal stimulus in all the world’s major economies. It wasn’t all just fiscal expansion either. From a value of 6.25% in early August 2007, the US Federal Reserve discount rate was reduced to 5.75% later that month, to 4.75% the month after, and then again to 4.5% the month after that. In January 2008 the Fed cut interest rates by 0.75 percentage points, the largest single reduction in over a quarter of a century. In October 2008, just one month after their concerted action on international money market liquidity, six of the world’s most important central banks coordinated a simultaneous interest rate reduction of 0.5 percentage points. By the end of October, the US Federal Reserve had again slashed interest rates, this time down to 1%, the lowest level since 2004. The following month, the European Central Bank cut interest rates by 0.75 percentage points, its largest ever single reduction; Sweden’s Riksbank, by a record 1.75 percentage points; the Bank of Korea by a record 1 percentage point; the Bank of Canada lowered its benchmark rate to 1.5%, the lowest since 1958. In December, the US Federal Reserve’s discount rate had gotten down to between 0 and 0.25%; Japan’s, 0.1%; China cut interest rates for the fifth time in four months. The following month, January 2009, the Bank of England reduced its interest rate to 1.5%, the lowest setting in over 300 years of the Bank’s operation. Monetary stimulus had by then become not just a matter of reducing interest rates. After all, interest rates were already effectively zero. In November 2008, the US Federal Reserve injected US$800bn into the economy, buying US$600bn of mortgage-backed securities and applying the remainder to unclog consumer credit channels. The Bank of England similarly engaged in quantitative easing, buying securities with newly-printed money (£75bn in March 2008, and then £50bn in May and then again in August 2009) to reach a total outlay of £175bn (US$294bn) by the end of 2009. The European Central Bank, in June 2009, pumped US$628bn in one-year loans into the Eurozone’s banking system. In the current Eurozone crisis, one hears talk of the troika (the European Central Bank, the European Union, and the IMF) taking a bazooka to the sovereign debt problem. If so, the collection of 2008-2009 policy actions might seem more akin to sending in an entire aircraft carrier. The second quarter of 2009 recorded the official end of recessions not just in the East, as described earlier, but also in the two largest Eurozone economies France and Germany, both seeing positive growth again after four consecutive quarters of GDP declines. Financial institutions reported profits: notably Goldman Sachs, JP Morgan Chase (profits up 36% from the previous year), Deutsche Bank (up 67% over the same period in 2008), Barclays, RBS, Italy’s largest bank UniCredito, and the Dutch financial services group ING. By September 2009, the FTSE 100 had again breached the 5,000-point threshold, recovering completely all losses since October 2008. Arrayed against this monetary and fiscal stimulus worldwide and the evidence of the world economy already growing again (admittedly most strongly in the East), one might conclude that policy-makers ought now cast a cautious eye on government balance sheets. But that choice for the UK still remained in delicate balance. In September 2009 the OECD had forecast the UK would be the only G7 economy still to be in recession by year-end, with both the US and the Eurozone predicted to show two quarters of consecutive growth. Three months earlier, the OECD had suggested the pace of decline among its members was slowing and that the world economy had nearly reached the bottom of its worst post-War recession, but that the UK would continue to show zero growth in 2010. In July 2009 NIESR predicted that UK GDP per capita would not recover pre-recession levels until early 2014. Effects of policies often only emerge with a lag. And, generally, government policy-making errs too often by not getting ahead of the curve. On top of all that, the UK is a small open economy, and its debt and output markets are strongly influenced by international developments. Was 2010 the right time to start restoring the UK government’s balance sheet? The UK’s debt/GDP ratio was in line with the largest Eurozone economies and therefore larger than Spain’s; its deficit/GDP ratio was worse than all except Ireland’s. By July 2009, UK government debt had risen to 57% of GDP, the highest ratio since 1974. That month, the UK’s public sector net borrowing showed its first July deficit in 13 years. Earlier in the year, Spain had become the first AAA-rated sovereign nation to have its credit rating downgraded since Japan in 2001. In December 2009, Greece acknowledged sovereign debt exceeding €300bn (US$423bn), the highest in modern history, resulting in a debt/GDP ratio of 113%, nearly double the Eurozone limit. 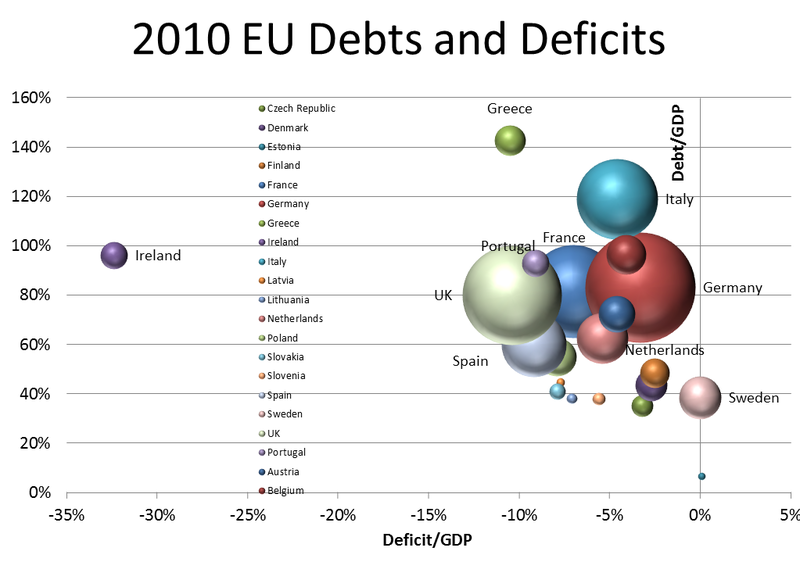 The chart shows the UK in 2010 right among the pack of the largest European economies (the size of each ball indicates total GDP) in its debt/GDP ratio, i.e., larger than Spain’s, but with a worse deficit/GDP position than all except Ireland. In February 2010, it didn’t take a lot of imagination to see how, all else equal, UK government borrowing could easily have become just as expensive and as difficult as in the most stressed Eurozone economies. In retrospect, of course, we know the austerity policy did not work in the UK. A reversal might well be warranted, because circumstances had changed, not because things were the same. After the first couple months of 2010, the Eurozone economy went into free fall much faster and much further than one might have expected. This had two effects on the UK fiscal position: on the one hand, UK debt turned out looking, well, not so bad after all relative to comparable advanced TransAtlantic economies. The fear that UK borrowing would become overly costly had become much less relevant. Germany has kept growing exports through a shift in their direction of motion. So, the international environment has shifted in such a way that the urgency for UK rapid debt reduction has lessened. The other large factor is how market perception on the stance of UK monetary policy too has shifted. For most observers now, the Bank of England has made clear how it is willing to put even more resources into monetary easing. What can one conclude from this? First, policy-making needs to be sensitive to circumstances, and today in the UK, that means international circumstances especially. Monitoring and assessing the state of the world economy is needed. Second, expansionary policies need to be more sharply designed. While austerity might not, under the current circumstances, any longer command the support it once did, pro-growth proponents need to explain things better. Just throwing money at the problem plainly does not work. Obviously, the world’s expansionary policies over 2008-2009 succeeded out East, but they did nothing to revive the UK economy. Why will they do so now? How will this time be different? Very nice write-up. The public likes black-and-white pictures, which is why the debate is always between either growth or austerity. But as you noted, it’s much more complicated. The problem with the UK (and with the US) is that there is no realistic adjustment mechanism to offset the negative growth effects from austerity. UK households are still debt-contrainined and are running high net saving rates. UK businesses aren’t investing, because of the broader uncertainty created by the Eurozone crisis. And it would be great if the value of the pound would fall, boosting exports, but that’s tough to achieve when many developing countries are still artificially devaluing their currencies. At the moment, fiscal deficits are the only thing filling the demand gap; take them away, and the gap only becomes larger. There is obviously a point when deficits need to be reduced. The Japanese story, however, indicates that it’s really difficult for a politically stable economy that issues all of its debt in its own currency to experience a debt crisis. In short, the UK and US are probably still really far away from the danger zone — despite what the Rogoff and Reinhart research suggests. Plus, in terms of visible constraints, it’s really the interest-burden-to-GDP ratio that matters, not the debt-to-GDP ratio. And on that measure, the US is actually doing very well: interest payments as a percentage of US GDP are at a post-WWII low. (Not sure about the UK, but I’d assume a similar story, given how far yields on gilts have dropped). Separate economic growth estimates from the Organisation for Economic Co-ordination and Development (OECD) said that the German economy could contract by 1.4% in the last quarter of 2011.